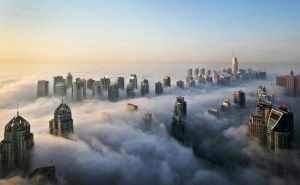 As reported in Durability & Design a new study looking at socio-economic trends over the next 30 years suggests that the construction of skyscrapers will continue to climb. Estimates are that around the globe there will be 6,800 skyscrapers per 1 billion people compared to 800 skyscrapers per 1 billion people today. The recent study by Jonathan Auerback and Phyllis Wan also predicts that future skyscrapers will stand 50 percent taller than those towering above us today. This forecast is not startling if you consider increasing population density in urban centers. After all, going “up” is about the only option for accommodating more people in the same amount of ground space. According to the study, the construction and average height of skyscrapers has increased steadily over the years. In 1950, they tended to average close to 500 feet tall (or 40 floors); those numbers have gone up 8% every year since then, and the average height of a skyscraper today has doubled. If this pattern continues, the number of skyscrapers will outpace the 2 percent annual growth of urban populations, and by 2050, an additional 41,000 skyscrapers will have been constructed. There are some really tall buildings out there now, such as the Burj Khalifa (828 meters tall in Dubai), and there is every indication skyscrapers will continue reaching for the heavens. The Jeddah Tower (Saudi Arabia) which will be finished in 2020, will be 1,000 meters tall. The other interesting statistic that emerged from the study is that as the height of skyscrapers increases, the number of floors tends to decrease as the floor heights expand. So, in 2050, skyscrapers will be 50% taller than today, but will not have 50% more floors. Urban planners and architects acknowledge that as the global population continues to increase, vertical growth can be used to accommodate the additional density. This vertical momentum will also drive trends in the construction and building material industries, trends which are already emerging today, such as prefab panelization. 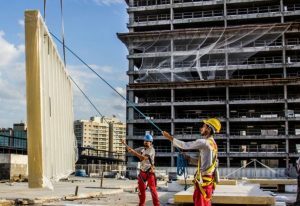 Hi-rise construction and buildings towering at great heights will require structural building solutions such as the manufactured, insulated exterior wall systems entering the marketplace today. Durable and lightweight systems with continuous insulation can install in less time with less manpower and can require less maintenance once in place, while also providing more energy efficiency and durability. Working at high elevations can be complicated and dangerous; prefab panels can help minimize these risks, simplify the installation process, and expedite building times while ensuring quality. As our buildings collectively reach for the clouds, emerging technologies will continue to revolutionize the construction industry. Clearly, prefabricated panel solutions will play an important role in this evolution.